Rather than make them simple bloodthirsty monsters, I wanted them to rise above it. I wanted them to deal with their very real need for blood (yes they do have to kill to survive), but not let it make them a slave to their cravings. Alyssa, the main character for example chooses to hunt criminals (rapists being her favorite midnight snack). While she feeds as often as she needs, she still manages to maintain a real friendship with her human friend Fallon. Beyond the blood lust, my vampires are capable of very strong emotions. Love being quite intense. It’s that intense love and connection that Alyssa (the main character) feels for her mate that is central to the plot of my recently released, Soulstone. In Soulstone, Alyssa must fight her clan, and the Acta Sanctorum to save her mate’s immortal soul. It’s a battle that begins at page one and doesn’t end until the last page. All the while, you’ll be taken on an adventure with the wolves and witches of Boston, break into an old church to steal an ancient magical tome, and fight alongside the Olde Town Pack to take back their territory from the Acta Sanctorum. As you can see, writing about vampires and making them my own is both fun and fulfilling. I can live the fantasy as well as shape it. It’s the best of both worlds. 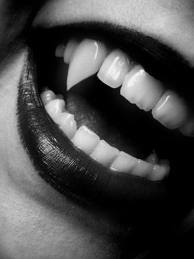 The biggest payoff though, is seeing others fall in love with my vampires as much as I have. Cool post, Katie. I love your comments on each writers way to envision their subject. I love your's on your characters. This shows a more human side to Vampires than other books. Thanks for stopping by, Dana!